My secret to winning a race? Sign up for the one that has the fewest people and the weirdest course. This is how I finally achieved my goal of a first place finish in a running race. 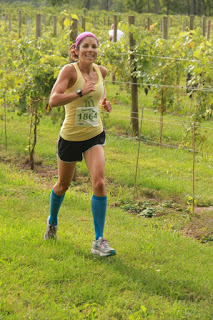 Run The Vineyards Unionville 8K & 5K was a trail race through the Unionville Vineyards in Ringoes, New Jersey. 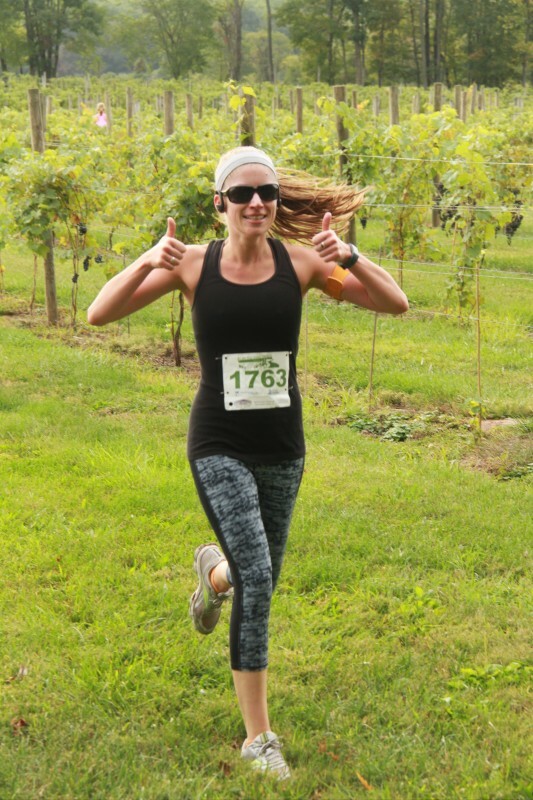 It was organized by Good Day for a Run, a small racing company that hosts a race series called "Run The Vineyards" throughout New Jersey and Pennsylvania. 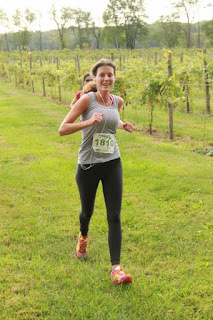 I ran this race on a weekend trip home to visit family in New Jersey. 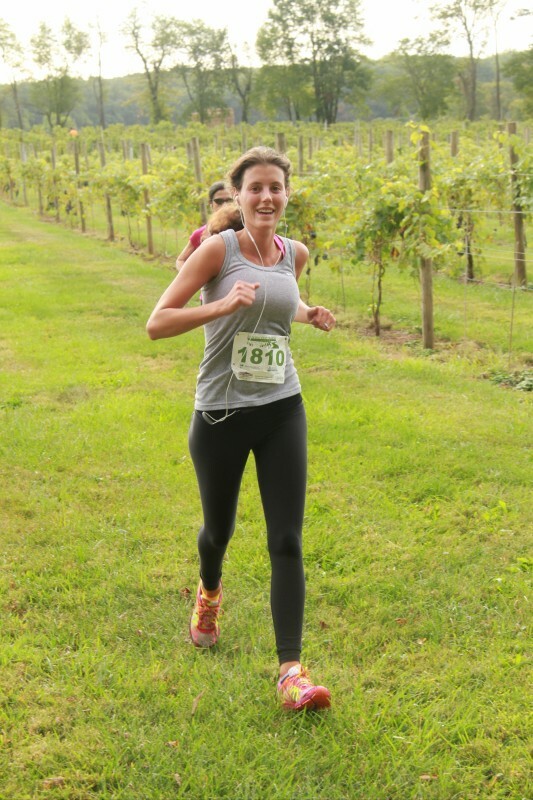 The event included simultaneous 8K and 5K trail races with a total of only 162 runners between both races. I wasn't kidding when I said it was small! My dad, sister, and neighbor ran the 5K while I ran the 8K race. It's way more fun to run when I coerce my loved ones into joining me. We spent the night before the race at my dad's house. My sister and I left his house neurotically early to allow time to park and pick up our race bibs. We discovered a nearly empty parking lot upon our arrival at the vineyard. Bib pickup was straightforward and uncrowded and we had ample time to use port-a-potties twice before lining up. The 5K runners lined up first and immediately disappeared from view, making a right turn into a field of vines. About 3 minutes later, the 8K race started. We scrambled straight downhill out the rocky driveway and across a small street into another field, where we circled the perimeter before snaking up and down its rows of vines. In typical fashion, I started a bit too fast. Through the first mile, there were two men well ahead of me but no women. 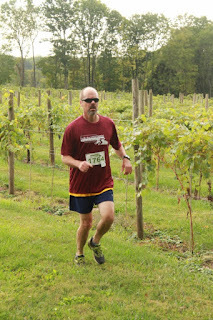 Just before reaching the mile 1 marker, I got myself into a bit of trouble when I missed the first turn into the vines. The turn had been well enough marked, but I was so fixated on maintaining my lead that I wasn't paying attention and there was no one nearby to keep me on track. It occurred to me that I'd made a mistake when I jumped over a section of orange tape. You're usually not meant to jump over tape in a race. After about 100 yards of off-course running, I made an about-face and found my way, sprinting, back to the correct path. By this time, three women had passed me. Although my blunder was a set back, I think it ultimately worked in my favor. I have never been the leader in a race, and I had no idea how to pace a lead spot. Those first few minutes of leading had made me feel a little frantic. With three women in front of me, I was able to regain composure and resolve to pass them one at a time. We turned back into the driveway and joined the 5K route. I caught a glimpse of the lone crowd supporter cheering loudly. It was my step mom, Missy. 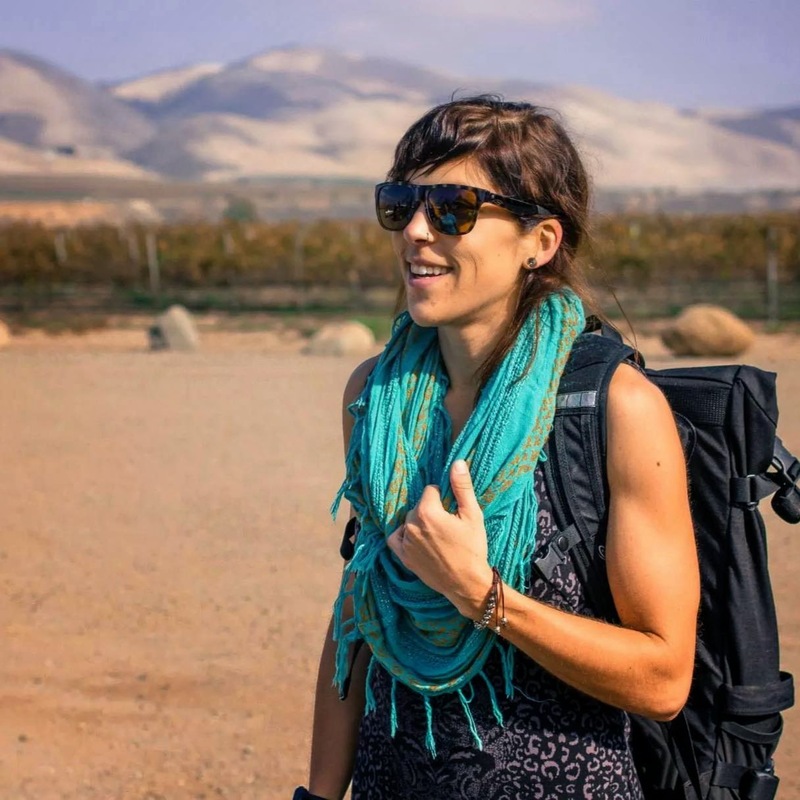 Once I was within a few yards of the leading woman, I decided to be patient and wait to pass her until I was sure I had gas in the tank to open up a lead. After taking over the lead, the race got a little funny. We snaked our way up and down rows of vines, making hairpin turn after hairpin turn. By this point, the front pack of the 8K race was catching and passing the back of the 5K race. Some of the lanes were narrow, and I had to politely alert walkers and runners to my presence behind them. I accidentally scared a few folks who wore headphones and didn't hear me coming. I crossed the finish line in 37:50. My watch told me I'd run 5.4 miles (an 8K is a 4.98 mile course). 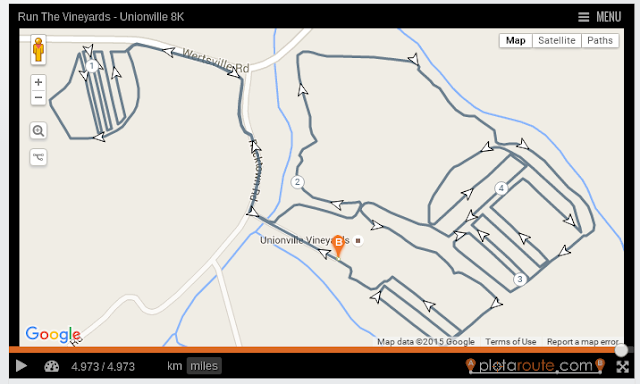 It appears I need to learn how to stay on course and run tighter turns. This was by no means an impressive pace, but I felt good about my effort on the uneven, hilly terrain and tight turns. I collected my family, who had all finished the 5K strong. They confirmed that I was the first woman to cross the finish line, and third finisher overall. Post race, we were offered free wine tasting. I do love a good 9 am glass of wine. 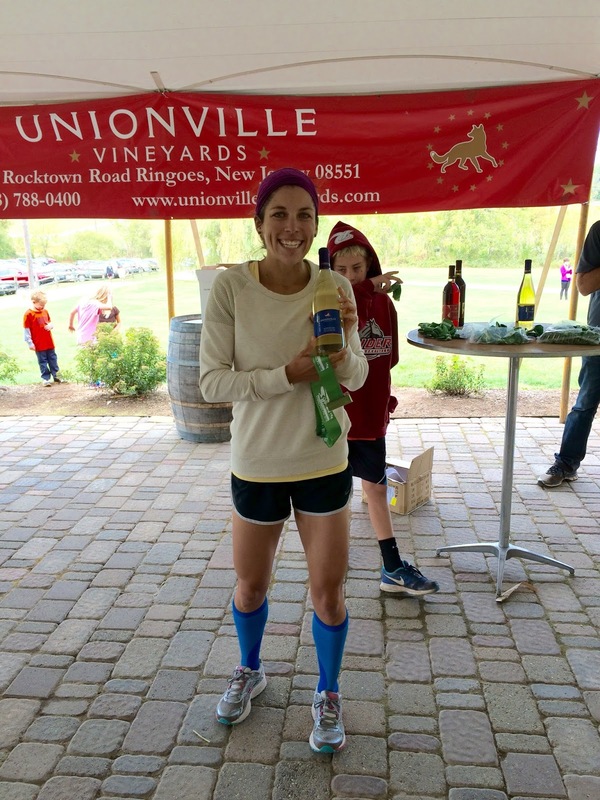 My first place winnings included a medal and a bottle of Riesling. Small races = more winnable. Trail running = way fun. Starting too fast = naive. Paying attention to course = important.